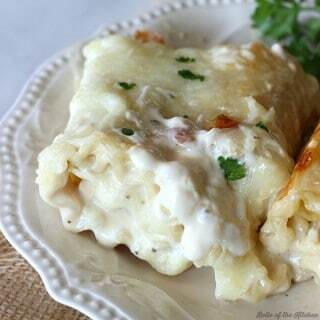 Make dinner time extra special with these easy Chicken Alfredo Lasagna Rolls! 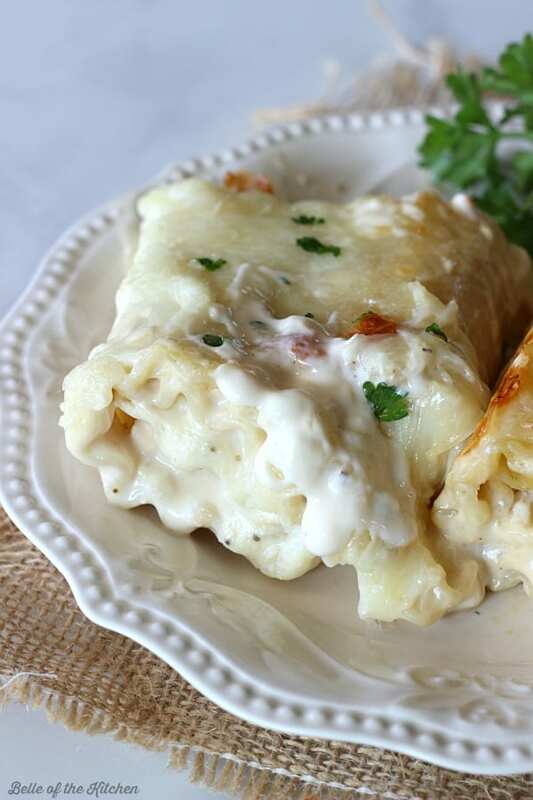 A blend of chicken, cheese, and spices are rolled up into lasagna noodles, then drenched in a creamy Bertolli Alfredo sauce. The whole family will love this one! Mmmm…. lasagna rolls. Just looking at these pictures makes me wish it was dinner time again. There is just something magical that happens when cheese, chicken, and noodles come together and get blanketed in a rich, creamy layer of Alfredo sauce. It’s the stuff of dreams! 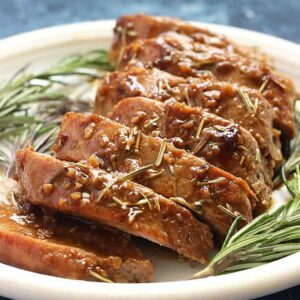 Since it’s February and Valentine’s Day is just around the corner, it’s time to start thinking of meals to make for your loved ones. 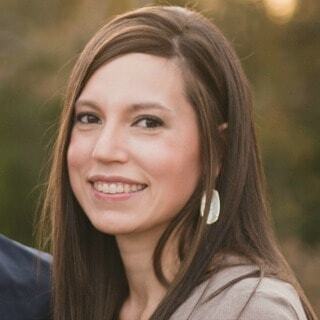 My husband and I actually got engaged eight years ago on February 15th, so that day has always been special to us. Flash forward eight years and two kids later, and now most of our special meals happen at home as a family. Going out can be expensive! One of our favorite meals is Chicken Alfredo, so I figured why not spice it up? Rolled up lasagna noodles are always more fun, right?! Especially when they’re covered in a creamy, delicious Alfredo sauce like Bertolli! 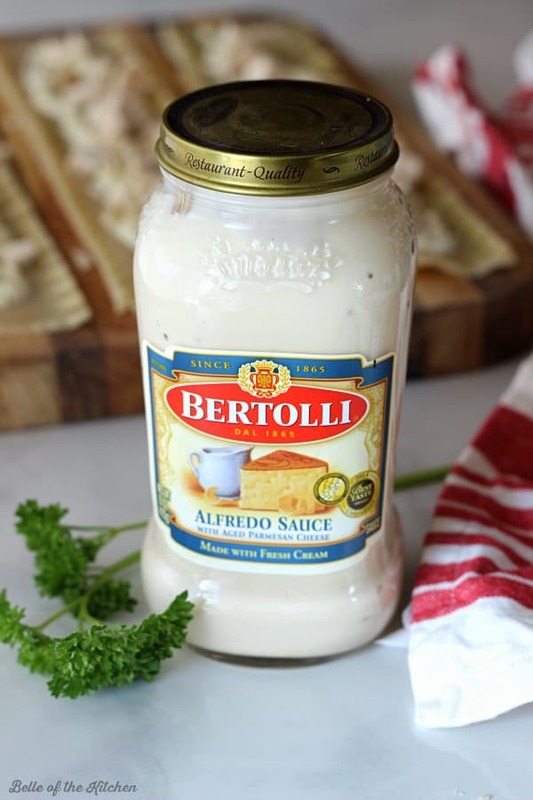 This Bertolli Alfredo Sauce is full of flavor and it made dinnertime easier and more enjoyable since I was able to get dinner in the oven in a snap. I love Italian food, so being able to get make a quick and delicious meal at home is always a win in my book. I’ve always wanted to travel to Italy and am hopeful that one day I will get to. When we travel, my husband and I joke that we do it with our stomachs! Yes, most of our trips are planned around the food since we love to try new places and new cuisine. Yelp is our best friend! If I ever make it to Italy, I’d like to check out “Viva Bertolli,” the original market stand created by Francesco Bertolli over 150 years ago where he sold olive oil, wine, cheese, and olives. From that same stand, he became the first exporter of olive oil to the United States! That tradition lives on through the variety of olive oils, sauces, and skillet meals that Bertolli sells today. Click the picture to go to the coupon! 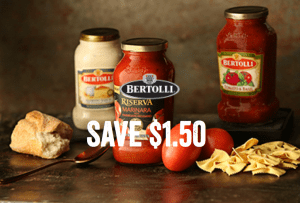 If you’d like to try out some of these great products, Bertolli has a $1.50 off coupon for you to use! 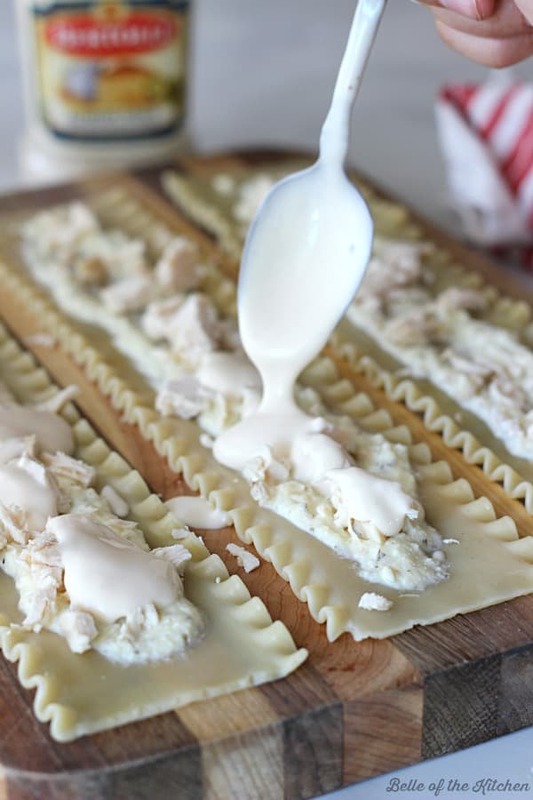 Be sure to visit Bertolli on Facebook and Tumblr for even more great recipe ideas. Make dinner time extra special with these easy Chicken Alfredo Lasagna Rolls! 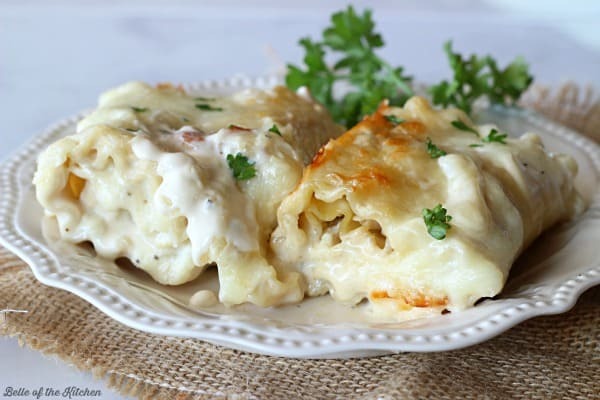 A blend of chicken, cheese, and spices are rolled up into lasagna noodles, then drenched in a creamy alfredo sauce. The whole family will love this one! Preheat oven to 350 degrees. Spray a baking dish with cooking spray and set aside. In a small bowl, mix together the ricotta cheese, egg, 1/4 cup parmesan cheese, garlic, and italian seasoning. Set aside. Spread out cooked lasagna noodles on a clean, flat surface (I used a cutting board). Spoon 1 heaping tablespoon of ricotta mixture down the center of each noodle. Sprinkle with chicken, then top with a drizzle of Alfredo sauce, about 1 tablespoon for each noodle. Roll up each noodle, then place seam side down in prepared baking dish. Top with remaining Alfredo sauce then sprinkle with mozzarella and remaining 1/4 cup of parmesan cheese. 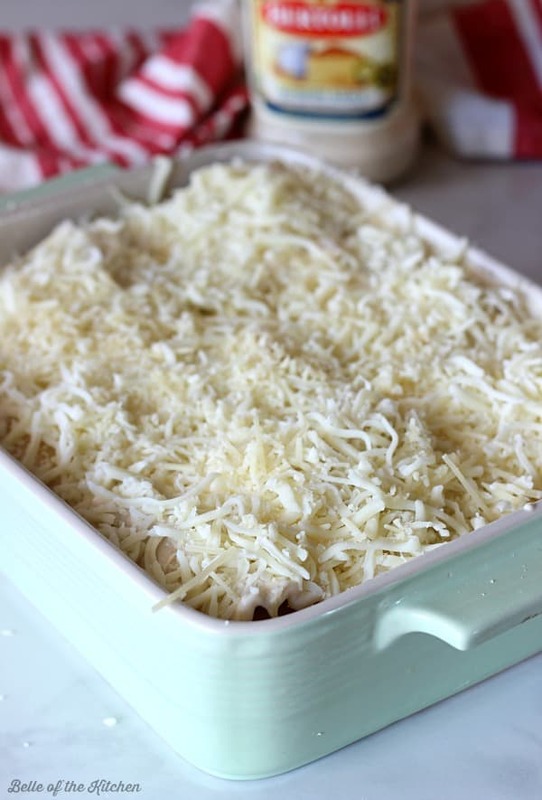 Bake in the preheated oven for 25-30 minutes until cheese is melted and bubbly. Enjoy! Comfort food at it’s finest! I so need to make this for dinner next week! I can just imagine how creamy this is. I hope to try it, but as gluten free. I am excited. Comfort food at its best! I sincerely hope you get that trip to Italy one day. Fabulous sights and FOOD! Talk about comfort food! 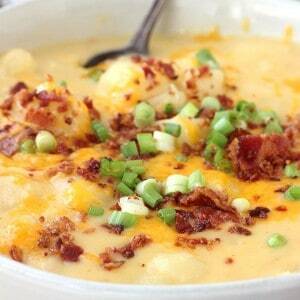 This recipe will be perfect for the chilly months ahead! You had me at alfredo. These rolls look delish! 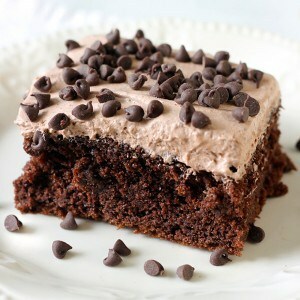 I would like to make these and put them in the freezer in aluminum pans, should I still spray the pan?? Has anyone baked these after being frozen? 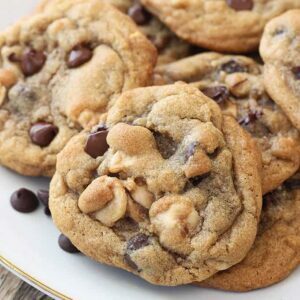 Can these be made and placed in the refrigerator overnight, then baked the next day? Hi Penny! They definitely can! Looks delicious! Do you have a calorie count? Yum! Those look so good…I need to try them! I know my family will love those! Wow, amazing! Looks absolutely delicious! I love the idea of using alfredo sauce over marinara to change it up a bit! I really want these for dinner tonight. These look so cheesy and creamy. Yum! Ashlyn, these look absolutely divine! So much cheesy goodness! Okay, I’ve never made lasagna rollups, but YES! These need to happen!! I love their sauces!! This is such a delicious looking recipe! Lasagna roll up is such a great dinner option. This one looks really good and creamy. Great job. These look so amazingly creamy! YUM! Such comfort food! And you can not beat Bertolli’s sauces. So good!